Although there are many scientific peer-reviewed journal articles studying the Urban Heat Island effect in depth for different case study cities around the world from a climatological perspective, there seems to be a gap between the sophisticated available technologies (remote sensing), and the local UHI policies for the vast majority of medium-size to large cities. Urban planners punctually use images processed by remote sensing, but our discipline has not appropriated such a powerful tool yet. The objective of this research is to explore the potential of the use of remote sensing technology for urban planners to be able to analyse the thermal behaviour of cities, in order to generate action plans for thermal master planning at the scales of the region and the city. Scientists, climatologists, and urban planners have started to recognize the importance of nature at two very different scales: the global (metabolic) and the local (liveability) scales. The regional scale is the one at which these macro and micro approaches overlap. Future predictions foresee an increase of more than 2450 million urban inhabitants by 2050, thus new balanced urban visions need to be developed in order to guarantee the sustainability of urban areas. The Urban Heat Island (UHI) effect is a climate phenomenon resulting from unbalanced urban design arrangements. This paper analyses several design principles proposed by the 1920's regionalists from the UHI perspective. The preservation of the regional geographical landmarks, the implementation of urban containment policies (limiting city sizes), the increase of greenery and the development of green multifunctional blocks would help reduce the UHI in future urban developments. The world is increasingly concerned with sustainability issues. Climate change is not the least of these concerns. The complexity of these issues is such that data and information management form an important means of making the right decisions. Nowadays, however, the sheer quantity of data is overwhelming; large quantities of data demand means of representation that are comprehensible and effective. The above dilemma poses questions as to how one incorporates unknown climatologic parameters, such as urban heat, in future urban planning processes, and how one ensures the proposals are specific enough to actually adapt cities to climate change and flexible enough to ensure the proposed measures are combinable and compatible with other urban planning priorities. Conventional urban planning processes and mapping strategies are not adapted to this new environmental, technological and social context. In order come up with more appropriate urban planning strategies, in its first section this paper analyses the role of the urban planner, reviews the wide variety of parameters that are starting to be integrated into the urban planners practice, and considers the parameters (mainly land surface temperature, albedo, vegetation and imperviousness) and tools needed for the assessment of the UHI (satellite imagery and GIS). The second part of the study analyses the potential of four catalysing mapping categories to integrate urban heat into spatial planning processes: drift, layering, game-board, and rhizome. In the Netherlands awareness regarding the Urban Heat Island (UHI) was raised relatively recently. Because of this recent understanding, there is a lack of consistent urban micro-meteorological measurements to allow a conventional UHI assessment of Dutch cities during heat waves. This paper argues that it is possible to retrieve relevant UHI information – including adaptation guidelines – from satellite imagery. The paper comprises three parts. The first part consists of a study of suited indicators to identify urban heat islands from which a method is presented based on ground heat flux mapping. The second part proposes heat mitigation strategies and identifies the areas where these strategies could be applied within the hotspots identified in the cities of The Hague, Delft, Leiden, Gouda, Utrecht and Den Bosch. The third part estimates the reduction of urban heat generated by the increase of roof albedo in the hotspots of the six cities. The six cities hotspots are located within the boundaries of the 17th century city centres. In order to avoid interference with cultural values of these historical environments most likely UHI mitigation measures regard improving the thermal behaviour of the city roofs. For instance, applying white coatings on bitumen flat roofs (or replacing them by white single-ply membranes) and replacing sloped roof clay tiles by coloured tiles with cool pigments can reduce the urban heat hotspots by approximately 1.5°C. Remote sensing provides high level information that provide urban planners and policy makers with overall design guidelines for the reduction of urban heat. The urban heat island effect is often associated with large metropolises. However, in the Netherlands even small cities will be affected by the phenomenon in the future (Hove et al., 2011), due to the dispersed or mosaic urbanisation patterns in particularly the southern part of the country: the province of North Brabant. This study analyses the average night-time land surface temperature (LST) of 21 North-Brabant urban areas through 22 satellite images retrieved by Modis 11A1 during the 2006 heat wave and uses Landsat 5 Thematic Mapper to map albedo and Normalised difference temperature index (NDVI) values. Albedo, NDVI and imperviousness are found to play the most relevant role in the increase of night-time LST. The surface cover cluster analysis of these three parameters reveals that the 12 “urban living environment” categories used in the region of North Brabant can actually be reduced to 7 categories, which simplifies the design guidelines to improve the surface thermal behaviour of the different neighbourhoods thus reducing the Urban Heat Island (UHI) effect in existing medium size cities and future developments adjacent to those cities. This thesis answers the overall question if the use of satellite imagery could help analysing the UHI in the Netherlands and suggests mitigation actions that can be implemented in the existing urban contexts of the cities, regions and provinces assessed. In order to answer this main research question a number of sub questions were formulated and studied from a theoretical perspective in part A: method. 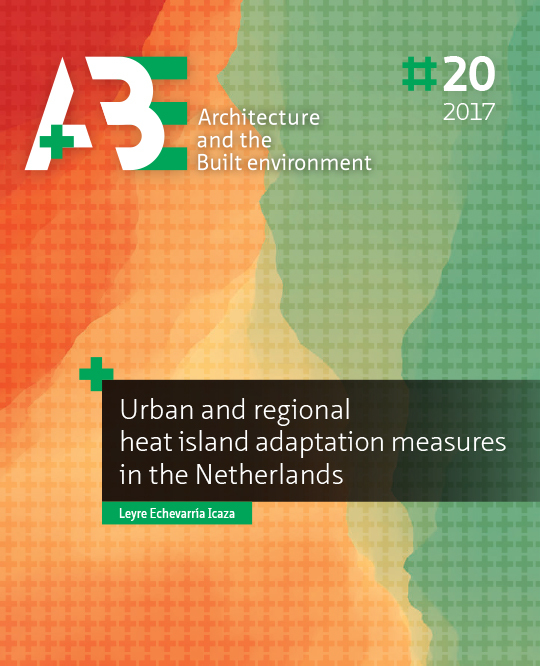 The investigation carried out in part A was used as a basis for the assessment of the urban heat in three specific case studies in the Netherlands in part B: results.